​ BARBADOS, a brilliantly bred son of four time Gr.1 winner and champion sire Redoute’s Choice and champion sprinter Virage de Fortune, was destined to stand at Ducatoon Park in South Australia according to Peter Toole. “The story of his history and how we came to buy him is really quite amazing. It was meant to be,” Peter said. “Steve, our youngest son, was working at Widden when Anabaa shuttled there and of course he is the sire of Virage de Fortune, and then Steve moved to Arrowfield when Redoute’s Choice was commanding a fee of $330,000. Steve was one of the few people allowed to handle the stallion and when we’d call him once a week for a family chat, he would tell us all about the superb mares the horse was covering, including Virage de Fortune in her first season at stud. “She had been sold to Darley a few months earlier for a record $3.4m, and then later Steve moved to Darley to work with the stallions. During his time there Virage de Fortune foaled a lovely grey colt and everyone held high hopes for the youngster as he had such a wonderful pedigree. Unfortunately, he broke his pelvis as a yearling and was confined to his stable for five or six months. “As he was recovering Steve would sometimes take the horse out for a walk and a pick, and he told us he liked him a lot. The injury meant he had a funny walk and moved his back end a bit like Marilyn Monroe. When he was broken in the breaker told Steve, who has just moved to look after the stallions at Peter Liston’s Three Bridges in Victoria, the colt was ‘phenomenal, for a three legged horse’. “Time passed and the horse went into work with Peter Snowden and was named Barbados. He ran a second and then won at his next two starts but was retired after just five runs and we eventually acquired him for Ducatoon Park just before the breeding season last year. Anyway, I had never met Peter, and my wife Valmae and I were at a horse sale earlier this year with a nice Northern Meteor colt we had bred and I saw Peter and decided to ask him about Barbados. “Peter remembered the horse well and said when he came to the stables he was a physical wreck because the injury had caused some muscle wastage on one side of his body. Peter said he persevered with the horse, describing him as ‘very fast’, and said he only had him fit twice, when he was second on debut and then when he won at his next start. By then he had problems on his good side, from compensating for the weakness from his injury, and although Peter was confident he could win a good race with him, the decision was made to sell the horse as a stallion prospect. “My brother and I ran Kambula Stud for many years and successfully stood stallions like Gay Gambler and Imprimatur, but when I left to go out on my own a few years ago I swore I wouldn’t stand another stallion. However, the industry in South Australia has changed a lot in the past few years and I felt breeders needed access to a well-bred stallion in our part of the world and Barbados certainly filled the bill when he was offered to us. I was prepared to look past his race record because I knew he had much more ability than that and he had been compromised by a really serious injury. That he was able to race and win told me he had plenty of courage and he really does have a superb pedigree, being inbred to speed influences Danzig and Bletchingly and tracing to one of the great mares in Emancipation. “We were lucky to get him really and once again fate stepped in. I contacted Bret Howard at Randwick Bloodstock looking for a stallion and he told me Barbados had been sold to Asia but was back on the market as the deal had fallen through. Of course I knew all about the horse, so my son Mark, who is with me on the stud, and I flew to NSW and did the deal with Darley’s Australian general manager Henry Plumptre, who also told us the horse “had far more ability than his race record suggests”. 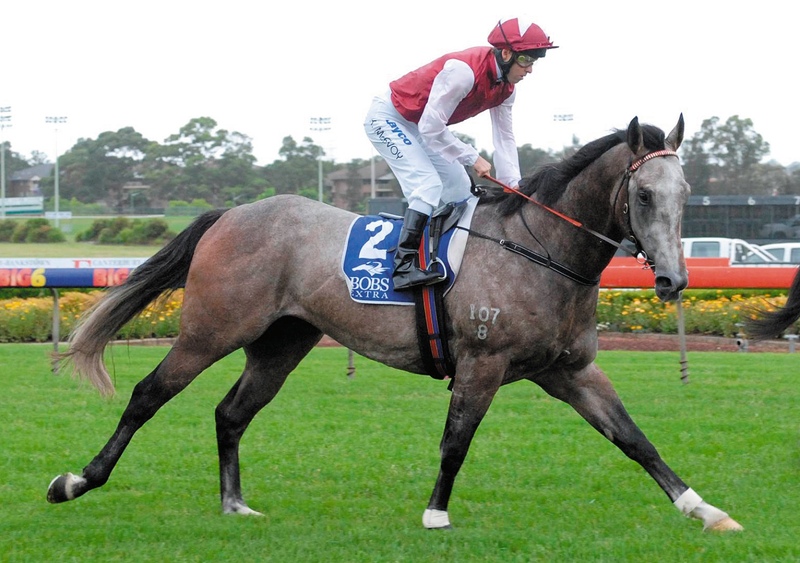 Peter and Mark have certainly chosen a horse with an exceptional pedigree as the foundation sire at Ducatoon Park. His sire Redoute’s Choice (Danehill (USA)-Shantha’s Choice by Canny Lad) has just won his third general sires’ premiership, with his son Snitzel as runner-up, with progeny earnings topping $10m in 2013-14 led by champion sprinter Lankan Rupee (dam by Stravinsky). In fact since retiring to stud in Australia in 2000 Redoute’s Choice, who won five races (four Gr.1 including the Blue Diamond and Caulfield Guineas) and $1.5m, has had 732 winners (77.5%) from 955 starters for earnings topping $105m. His 116 stakes winners (70 Group) include 24 at Gr.1 level including Golden Slipper winners Miss Finland (Woodman) and Stratum (Luskin Star), Blue Diamond winners like Nadeem (Sound Reason) and Undoubtedly (Don’t Say Halo) and others such as star fillies Samantha Miss (Zabeel), Lotteria (Sir Tristram), Melito (Marauding), Gallica (Kingmambo), Fashion’s Afield (Wild Again), Anamato (Whiskey Road), Royal Descent (Kaapstad) and King’s Rose (Nureyev) and colts of the calibre of Oakleigh Plater hero Snitzel (Snippets), Master of Design (Last Tycoon, line bred to Best in Show family), God’s Own (Sky Chase), Redoute’s Dancer (El Gran Senor, also line bred to Best in Show) and Musir (Encosta de Lago). Snitzel, who stands alongside his sire at Arrowfield, is one of his many successful sons at stud (six have sired Gr.1 winners) and these also include Stratum, Not a Single Doubt, Nadeem, Bradbury’s Luck, Duelled and Fast ‘n’ Famous. The latest edition of Stallions lists 14 of his sons at stud in 2014. His daughters have produced 29 stakes winners including Zoustar and Sacred Falls. Redoute’s Choice is out of Shantha’s Choice, a daughter of Golden Slipper winner and noted sire and broodmare sire Canny Lad (Bletchingly-Jesmond Lass by Lunchtime (GB)). She left nine winners including other Gr.1 winners Platinum Scissors (Danehill) and Manhattan Rain (Encosta de Lago) and the stakes winners Sliding Cube (Rock of Gibraltar) and Echoes of Heaven (Encosta de Lago). Second dam Dancing Show (USA) (Nijinsky-Show Lady by Sir Ivor) is a grandaughter of 1982 US Broodmare of the Year Best in Show (Traffic Judge) and left the Gr.1 winners and sires Hurricane Sky (Star Watch) and Umatilla (Miswaki) and a host of high class descendants including successful sire and Gr.1 winner Al Maher (Danehill). Redoute’s Choice and his sons have worked with mares from a variety of sire lines and inbreeding to the Best in Show family and to Nijinsky has worked well, while mares featuring Nijinsky’s close relation The Minstrel and similarly bred Storm Bird should suit Barbados as should mares from the Sir Tristram tribe, particularly Lonhro as his dam is by a son of Mr. Prospector, a line that has also worked well with Redoute’s Choice (and his sire Danehill). Doubling Lunchtime, via Pins for example, who has also worked with Emancipation’s family, also seems a positive way to go. Barbados made his race debut as a late two year-old after two 900m trials (fourth, second) in the $90,000 Rosebud Preview Handicap 1100m at Warwick Farm on July 23, 2011 and was beaten 2.5 lengths into second by stablemate Bello (Dr Doom third) on a heavy track. Bello went on to be second in the Rosebud-LR next time out and is now a Gr.3 winner (Newcastle Newmarket). Barbados was off the scene until October 31 when he won a Sydney 800m trial, the Sheikh Mohammed-owned colt then stepped out over 1100m at Canterbury on November 16 for a 1.25 length win over stakes placed Written Consent and I Get Around, running 1:04.17 on a good track. He was unplaced in three runs in December 2011 and January 2012 and did not race again. His dam Virage de Fortune (Anabaa (USA)-Virage by Kenmare (FR)) was one of the most talented female sprinters of the past 15 years, her eight wins including the MVRC Australia Stakes-Gr.1 (1200m) and QTC Sires’ Produce Stakes-Gr.1 (1400m), the latter among her five wins in succession from six starts at two. In addition to her Australia Stakes win at three, she also collected the MVRC Champagne Stakes-Gr.3 (1200m), the MVRC Schweppes Stakes-Gr.2 (1000m) and was runner-up to Snitzel in the Oakleigh Plate-Gr.1 (1100m) with Takeover Target third, and fourth in the T.J. Smith-Gr.1 behind Red Oog (Snitzel third). The dual Gr.1 winner, who was bred by Michael Sissian when he had Segenhoe Stud, made headlines again during April 2007 when offered as a broodmare prospect by Inglis at Newmarket. She was knocked down to Darley for $3.4m, then a record price for a thoroughbred sold at auction in Australia, and Olly Tait, then general manager for Darley Australia described her as a “beautiful type, fast and with a wonderful pedigree”. It was an amazing result for a yearling purchased by astute judge James Bester for $70,000, especially considering she went on to win $954,100 before being consigned by Bester and her fellow owners to the Inglis Select Broodmare Sale. Two of Virage de Fortune’s four foals are winners, the other is Sydney winner Torqueflite (Street Cry). Michael Sissian bred and raced her dam Virage (Kenmare-Emancipation by Bletchingly) and the filly, who was born in 1993, proved frustrating for Sissian and trainer Lee Freedman, running three seconds (twice in the city) in six starts at two and three, throwing away her chances by becoming claustrophobic in the starting stalls (in the days before barrier blankets). There was no doubt Virage had plenty of ability but in the end she was retired because of her antics. However she became a really good broodmare and her seven winners also include $730,000 earner and multiple Gr.3 winner Avenue (Anabaa) and stakes placed Glasnost (Red Ransom) dam of Gr.3 winner Slapstick (Anabaa) and stakes placed Censor (Elusive Quality) and Lorna Mae (Redoute’s Choice). After having nine foals in 10 years, Virage, who is now at stud in Victoria, had two years without a foal (not served one season) and then produced a Redoute’s Choice colt in 2010, missed two further seasons, then foaled a grey filly by Wanted in 2013 and was again covered by that stallion. Her sire Kenmare (FR) (Kalamoun-Belle of Ireland by Milesian) was a Champion Sire in France and came to Australia in 1988 after being purchased by John Messara for his Arrowfield operation. The stallion had great success here in 10 seasons, leaving more than 340 foals including the outstanding sprinters Keltrice and Kenvain, the champion South African Filly Joie de Grise (whose daughter by Fort Wood, Joie de Soleil (SAF), is in the Emirates Park broodmare band), the Australian Oaks winner Kenbelle (dam of triple Gr.1 winner Boban), Australian Guineas winner Baryshnikov, South African Derby winner Fire Arch, and Silver Slipper winner Kenfair. His northern runners included the Gr.1 winners Highest Honor, Kendor, St Andrews and Verte Amande. The imported L.K.S. Mackinnon Stakes-Gr.1 winner Glass Harmonium (IRE) (Verglas-Spring Symphony by Darshaan), who stands at Blue Gum Farm on $6600, is a grandson of Highest Honor. It was a case of the meeting of two greys when the Prix Jacques le Marois-Gr.1 winner Kenmare covered the champion mare Emancipation in the spring of 1990. The filly who resulted from that mating was sent to South Africa and was never named. However the mating was repeated two years later (the mare visited Danehill in between times) and Virage was the result in 1993. She is among seven named foals from her dam and four of the other six were also fillies, Animation (Vice Regal), Principation (Prince Echo (IRE)), Felicitation (Danehill) and La Suffragette (Palace Music (USA). While the colts were the Gr.2 winner and AJC Derby-Gr.1 runner-up and sire Royal Pardon (Vice Regal) and the city placed Liberty Prevails (Bakharoff (USA). Like so many great mares Emancipation (Bletchingly-Ammo Girl by Gunsynd), who is inbred 3mx4m to Star Kingdom (IRE), did not leave any champions, but her family is breeding on and there are plenty of stakes horses in her clan these days including dual Gr.1 winner (Caulfield Cup, The Metropolitan), Railings (Zabeel), Gr.2 winner Magneto (Scenic), Gr.2 winner Pimms Time (Pins), the South African Gr.1 winner Rumya (Red Ransom (USA)), Listed winner and Gr.1 runner-up Raid (Pins), UAE Oaks-LR winner Raihana (Elusive Quality (USA)) and HK Derby-HKGr.1 runner-up Jackpot’s Delight (Danasinga). Emancipation could be a very tough mare to handle but there was no doubting her courage as she won 19 (1200m-1750m) of her 28 starts and her six Gr.1 wins came in the Doncaster, All-Aged Stakes, George Main, Rosemount Classic and George Ryder Stakes, (twice). Trained by Neville Begg, she was Australian Racehorse of the Year in 1984, racing in the colours of Muskoka Farm’s Bob Lapointe. She was bred by Mark Hough who had purchased her dam from Tommy Smith for just $1700 and put her to Bletchingly (Biscay-Coogee (GB) by Relic), the brilliant sprinter just beginning his stud career at Widden on a fee of $1500! Bred by expat Stanley Wootton, the man who exported Star Kingdom (IRE) to Australia and retained a share in the horse for his stud career, Bletchingly (by Biscay, by Star Kingdom) won four of his five starts and was runner-up in the other. He won the MVRC Windarra Handicap (1200m) at his only run at three and then the VRC Moomba Handicap (1000m) in course record time and AJC the Galaxy-Gr.2 (1100m) at four. He went on to sire many great horses including champion Kingston Town, and his name also appears in the pedigree of Barbados as his Golden Slipper-winning son Canny Lad is the damsire of Redoute’s Choice. There is another line of Star Kingdom in this pedigree as Emancipation’s unraced dam Ammo Girl is by the people’s champion Gunsynd (Sunset Hue-Woodie Wonder by Newtown Wonder (GB)), whose sire is a son of Star Kingdom. Gunsynd (1967-1983), known affectionately as the Goondiwindi Grey, began his career in Queensland before transferring to the Sydney stables of master trainer Tommy Smith. He won 29 of 54 starts including the Epsom Handicap, Toorak, Queen Elizabeth, Doncaster, Caulfield Stakes, Cox Plate, Rawson Stakes (twice) and he was beaten 1.25 lengths and a neck in the Melbourne Cup, conceding the first two 12.5kg and 8kg. Although he had won to 2400m, the 3200m of the Cup was well out of his comfort zone and his effort highlighted his courage and will to win. He had a short career at Kia-Ora Scone when the property was owned by John Clift, but died young and was not a great success (6SW). However his name lives on via Ammo Girl and her descendants as her five named foals were all winners and included the Gr.2 winner Appreciation (Sovereign Rocket), whose family is breeding on. Another winning daughter, Deliberation (Shifway) produced the stakes winner Accumulation (Last Tycoon) and the stakes placed Many Hands (Handy Proverb) who is a noted producer, leaving Dextrous (Quest For Fame), whose progeny include Gr.1 winner Skilled (Commands), Gr.2 winner Ambidexter (Commands) and Gr.2 winner and Golden Slipper-Gr.1 runner-up Sidestep (Exceed and Excel). This is also the immediate family of Australian Oaks-Gr.1 runner-up Light Work and Gr.2 placed More Haste (dam of Gr.3 winner Proverb). Ammo Girl’s dam Miss Wendy, by the temperamental Sostenuto (ITY) (Never Say Die-Arietta by Tudor Minstrel), only managed to win at Muswellbrook, but she is a half-sister to Golden Slipper-Gr.1 winner Hartshill (My Heart), winner of 15 races but a poor breeder whose only daughter was infertile. Miss Wendy left four minor winners from nine named foals, while her dam Victory Piper (Pipe of Peace-Sweet Victory by Newtown Wonder), who was placed several times in the city, left eight named foals and all were winners. Her descendants include Hero Wind, Small Minds, Marwin Gold, Full Scope, Classic Benbara and Prince Benbara and the Gr.1 winners Ofcourseican and Gimmethegreenlight (South Africa) and Gr.1 placed Gregers and Moon Magic. City winner and Widden Stakes-LR runner-up Sweet Victory left just five named foals but they included the Gr.2 winner and sire Par Avion (Sky High) while a daughter produced Gr.2 winner and Gr.1 placed sire Eleazar (King of Babylon) The family came to Australia with the importation of Sweet Victory’s dam, Victory Flight (IRE) (Sayajirao-Oriens by Hyperion), in the 1950s and her six winners included the tough Victory Roll (Pipe of Peace) whose 21 wins included the Rosehill Cup-LR. Her placed daughter Dream Flight left the Listed winner and Golden Slipper third Jewel Flight (Baguette), dam of Gr.1 winner Diamond Shower (her descendants include Double Your Bet and Cheval de Troy). This is family 3l and Victory Flight is a half-sister to Tarien (GB) (Tehran), a very good mare trained by Tommy Smith in the early 1950s (he trained many from this family) to win races like the Craven Plate, George Main, Warwick Stakes (twice), Rawson Stakes and Challenge Stakes and who was disqualified after winning the 1953 Doncaster when returning a swab irregularity. Oriens, ninth dam of Barbados, is a sister to the Newmarket Stakes winner Radiotherapy and they have half-brothers Chaucer and Swynford 3x3. They are sons of outstanding broodmare Canterbury Pilgrim, a name writ large in the pedigree of Star Kingdom (she is his seventh dam and Chaucer is the dam sire of Hyperion). This could be worth keeping in mind when considering mares suitable for Barbados. Luskin Star (by Star Kingdom son Kaoru Star from a mare by Sostenuto’s half-brother Idomeneo) and Danzero (whose dam is similarly bred) are names to keep in mind, while Hurricane Sky will provide another line of Bletchingly, another son of Arietta in Romulus, another line of Pipe of Peace and of course duplicate Dancing Show. Daughters of Kenvain will duplicate Kenmare, while his second dam Hot Rhythm is bred on the Sostenuto/Pipe of Peace cross.